Global markets had an August/September to remember, then a massive rebound back near the pre-correction highs, and now a return to the August/September blues. We’ve mentioned each time the corrective bug has bitten that internal market sentiment indicators have popped towards pessimism levels more in-line with the Armageddon sentiment readings observed when things were the worst during the 2008/2009 catastrophe than with sentiment levels normally observed during milder (but certainly still painful) intra-cycle corrections. For instance, in August and September, recall that pessimism levels exceeded those experienced around the 2009 crisis bottom. Are markets experiencing a similar situation during this correction? For the most part, yes; sentiment indicators have jumped back into extremely negative territory, though many haven’t yet come close to reaching the crisis-like sentiment observed four months ago. 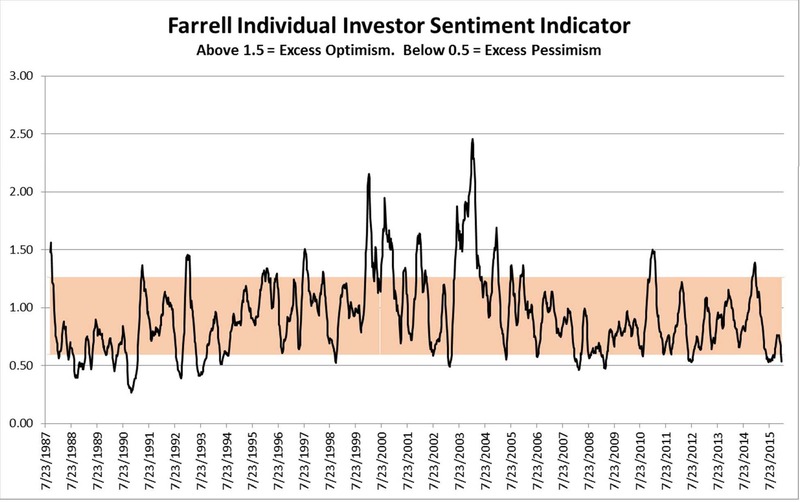 Let’s begin by looking quickly at individual investor sentiment expressed via the Farrell Sentiment indicator, which uses a formula derived from the bull, bear, and neutral numbers to get a truer reading on sentiment levels. Remember that readings of the 10-week moving average below 50 indicate extreme pessimism, while readings above 50 indicate extreme optimism. 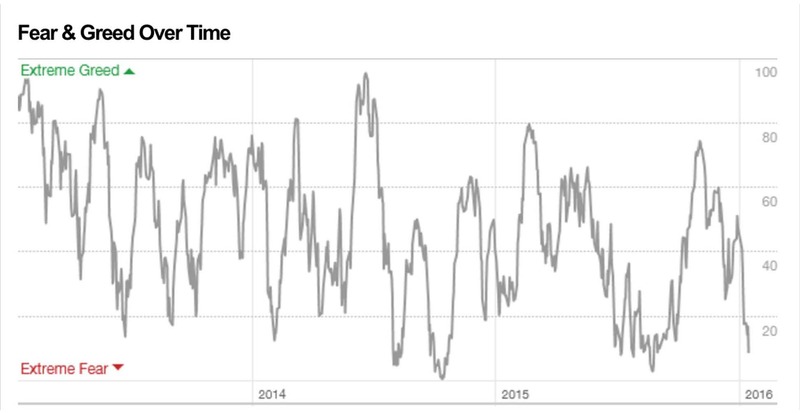 As with many other sentiment indicators historically, extreme bearish readings tend to be more predictive than markets of extreme optimism. As you can see below, the indicator is very close again to falling below the important 50 level, a threshold that hasn’t been breached since the crisis days of 2008/2009. Of note: looking at the internals, the 4-week moving average of bullish sentiment has now fallen below the levels observed in March 2009 at the absolute bottom of the great recession/financial crisis. Unlike the individual sentiment numbers, however, put/call ratios have yet to reach the pessimistic heights of the late summer, though they’re moving that direction rapidly. 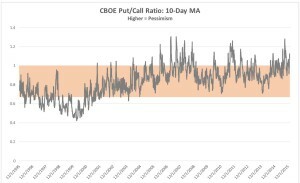 The more widely observed CBOE put/call ratio is now back to levels nearly 2 standard deviations above normal, a level that has often been associated with past short to intermediate term rebounds out of corrections. The ISES put/call presents a similar picture. While long-put and long-call only options activity here shows levels of pessimism are near the 2009 crisis lows, the August fear level isn’t yet close to being breached. 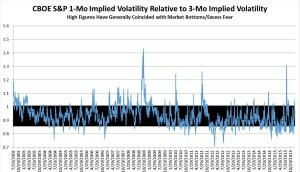 Another indicator we’ve watched closely during swift market corrections is the relationship of the VIX, which measures 30-day index implied vol, with its cousin the VXV, which measures 90-day implied vol. When the VIX level exceeds the VXV level, creating an inverted volatility curve, levels of pessimism are beginning to get out of bounds. As you can see below, this indicator nearly reached the massive outlier levels of 2009 during the late-summer dip. Right now, the spike higher, while certainly noticeable, is far from being remarkable. As of this writing, the ratio is about 1.6 standard deviations above normal. 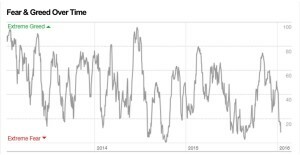 For a final unifying visual, we’ll borrow from the CNN/Money website, which produces a composite “Fear/Greed” index daily based on a number of different indicators, such as the ones listed above. As of yesterday’s trade date, the index had fallen to 9, almost to the levels observed in August. We’ll assume that this will meet or break downward through the August lows if today’s negative market action holds up. Add it all up, and just like during the August/September swoon, we think this is a correction and not the beginning of a 2000 or 2008-style market catastrophe. As of right now, there’s nothing to indicate that developed country markets in the US or around the world are near-term ready to enter a recession. We’ll watch the indicators like hawks and will certainly change our minds quickly if those risk indicators begin to push into dangerous directions. 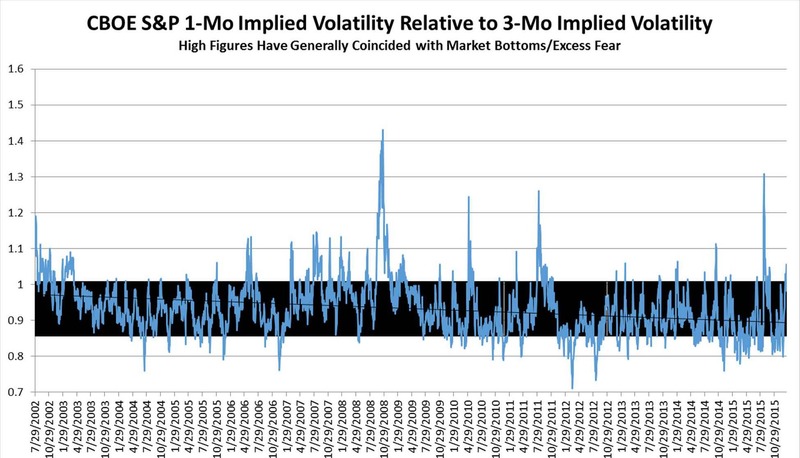 We’ve said in the past we believe markets could grind higher, though the past couple of years out of the big 2013 show that it’s been more of a frustrating sideways grind. It’s not far-fetched to think that this year could be very similar again to last year. Keep in mind, though, that the S&P 500 is the only major index (EAFE, Emerging Mkts are the other parts of the mix) trading above historical median on a normalized adj. P/E basis. Even then, the S&P 500 is only about ½ a standard deviation above the long-term mean in our work. That’s doesn’t mean markets can’t fall, but does give us some comfort that much bad news is being priced in by market participants around the world, especially in the beaten-down emerging market sphere. 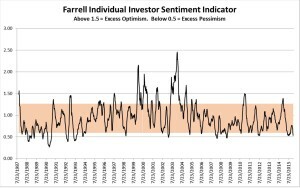 Sentiment indicators certainly continue to show that investors remain far more pessimistic than the recent declines suggest are warranted.